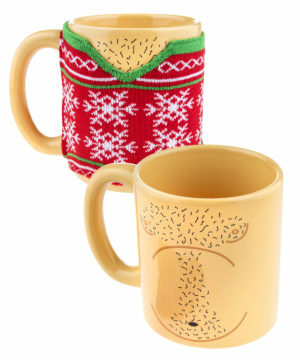 Ugly Sweater Mug: A hairy-chested mug with removable holiday attire. Whether you need a strong cup of coffee to jumpstart a busy morning or a steaming cup of cocoa to relax with on a silent night, the ever-funny Ugly Sweater Mug is drinkware that’s just your style. The ceramic mug is wrapped snugly in an awesomely cheesy holiday sweater with a notched front that proudly shows off a hint of chest hair underneath. Remove the knit pullover and reveal an illustration of a man’s barelled chest that’s both sparsely drawn and overly-detailed. Whether you prefer the drinkware clothed or au naturale, the oversized cup holds 20 ounces of your favorite liquid in gaudy goodness. 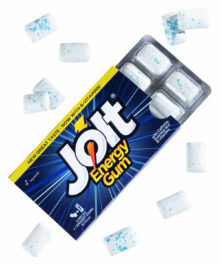 It also adds a new level to the phrase, “That’ll put some hair on your chest!”.